Some books come my way because of reading challenges. This book is one such, but I think I can honestly say that I would have read this book even without a reading challenge, it’s just that BCBE made me read this sooner than I might have. Some books make a mark because of a good cover, others because of a good plot. 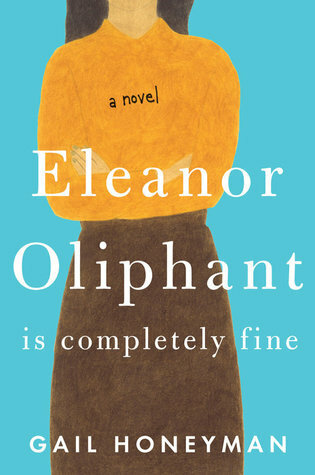 This book makes its mark because of a character, and that is Eleanor Oliphant. Eleanor thrives on routine. She has a good job, but no one really notices her. And she’s okay with that. She is a “creature of habit” and she hates to go out of that. She has no diplomatic skills, and often says out loud what she is thinking. This is fine, and “fine” works for her just fine. Until she meets Raymond, the IT person at her office. By kismet, they are together when they save an elderly gentleman Sammy, and the three strike up a friendship. Each are alone in their own way, and they save each other from it. Have I met Eleanor before? I could have sworn I’ve met Eleanor in real life. Her character feels so familiar. But that’s the beauty of Honeyman’s writing too. I could relate to Eleanor in many ways, though I’ve not taken to habit quite like her. I really despised the character of Eleanor’s mother. As the novel progressed, I could see how much her mother’s words had got to her. At times, I felt sad for her. The value of a good friend is emphasized by the novel. Raymond’s impact on Eleanor is profound. And Sammy too. The book showed a lot of things to remember and absorb. That routine can be terrible in the long run, that friendship can be life changing, that another’s voice in our head can be so loud that it overpowers our positive version of who we truly are. It shows there are people in our lives who will be there during the worst moments we experience. I love the ending to this book, which changes Eleanor’s life without changing who she was. This is a gem of a novel, and I’m happy to have recommended this and gifted this to a few friends already! Thanks for the review! It’s a title I’ve found intriguing, it seems like it would be a fun read. Thank you, Isa-Lee, I hope you enjoy the read. This book is one of my favourites! I absolutely loved how the book progressed and all the little things that it had to teach each one of us. Yes! I loved the book too and agree with your thoughts as well. Thanks Reems! I really enjoy reading your thoughts on these books. I’ve heard of Eleanor Oliphant of course, but it’s interesting to hear what you have to say. Anyway, I just came to say ‘Hi’. I hope you are having a great day. I’ve had better days perhaps, Jackie. Glad you are finding my bookish thoughts interesting. 🙂 Thanks very much.